Mission Hills is a neighborhood in San Diego located on the hills overlooking Old Town and the San Diego Bay, just north of Downtown, west of Hillcrest and south of the San Diego River valley. 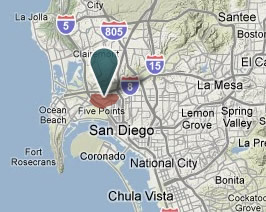 It is one of San Diego’s oldest and most desirable neighborhoods. The area is primarily residential with some small shops and restaurants. It is one of the most architecturally impressive neighborhoods with many of the houses from the early 1900s, which have been carefully preserved and restored. Modern homes were built as infill along canyon rims in the 1950s and 1960s. Mission Hills is highly sought after with its stately homes, quaint Craftsman bungalows and large mansions pristinely manicured on quiet streets. The business district is home to a variety of restaurants, shops, pubs and services.